Snow mold refers to a group of diseases that occur in cool to cold weather and are favored by snow cover. The principal diseases are Microdochium patch, Typhula blight, Coprinus snow mold, and snow scald. 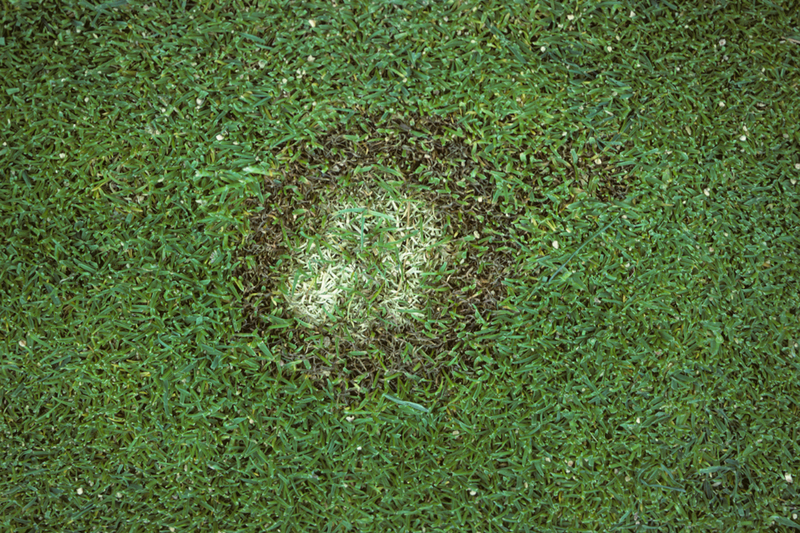 Microdochium patch caused by Microdochium nivale (formerly Fusarium nivale) is commonly referred to as pink snow mold due to the occurrence of spores in a pink matrix of mycelium and sporodochia (fruiting bodies) under moist and sunny conditions. 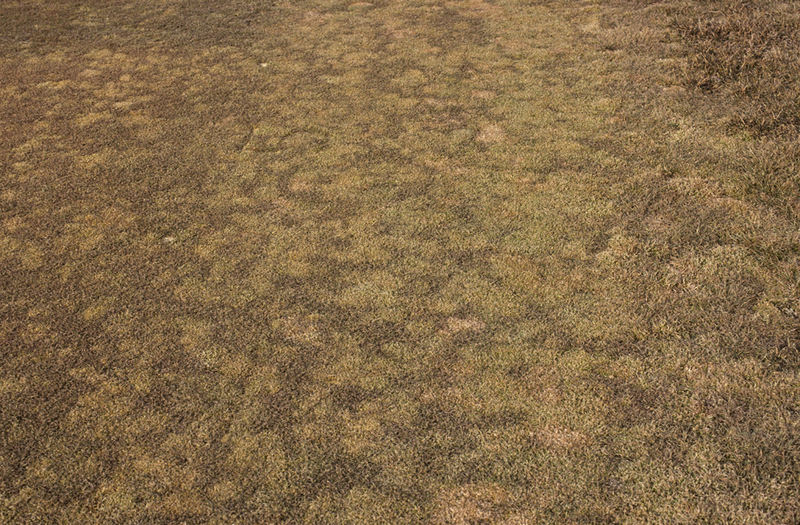 The disease is not confined to snow-covered turf, but can occur year-round in cool, humid areas. The pathogen damages almost all species of grass and often occurs together with other cold weather diseases. Symptoms develop following long periods of cool, wet weather and first appear as small water-soaked spots which turn orange brown to dark reddish brown before fading to light gray or tan. The spots are usually less than 8 in. in diameter with a water-soaked, gray black margin. Under snow cover or in very wet conditions, spots may be covered with a fluffy white mycelium. As the snow melts, spots appear bleached white to tan, often with a pink margin. M. nivale survives unfavorable periods in plant debris and infected plants. The pathogen grows rapidly under overcast, wet conditions and temperatures ranging from near freezing to 60° F. Conidia and infected debris are transported to healthy areas on equipment and shoes. 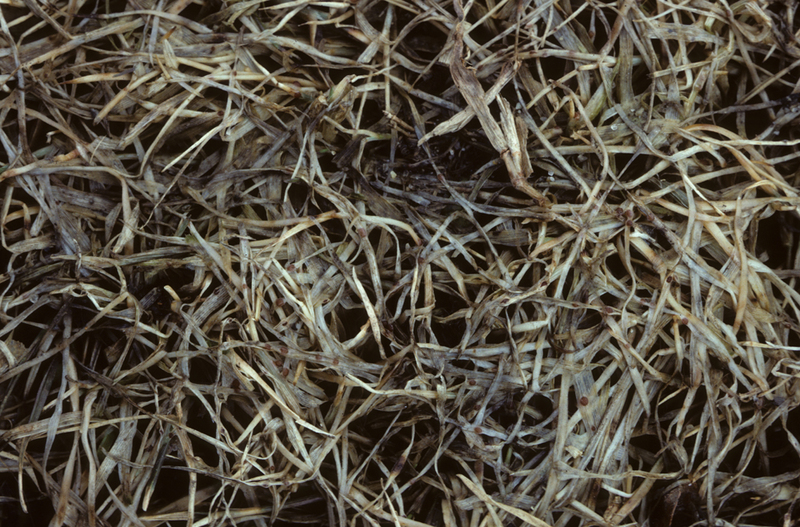 Microdochium patch is most severe in excessively thatched turf that is growing slowly and under snow covering unfrozen soil. It is favored by repeated frosts, cold fogs, slow, drizzling rains, high nitrogen levels, and matted foliage. The disease becomes inactive during warm, sunny periods and when there is little surface moisture. Typhula blight caused by Typhula incarnata and biotypes of T. ishikariensis are also called gray snow mold due to the characteristic gray white mycelium that appears at snowmelt. 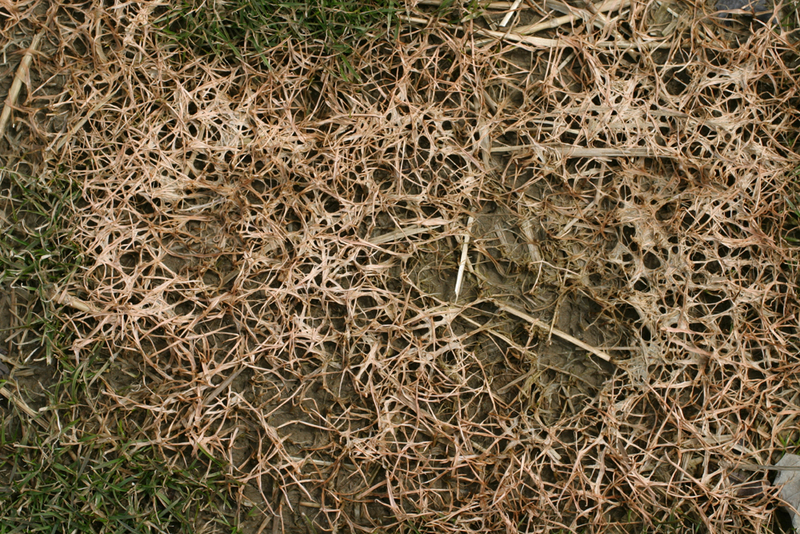 The disease occurs where snow cover is present throughout the winter and infects all turfgrasses. 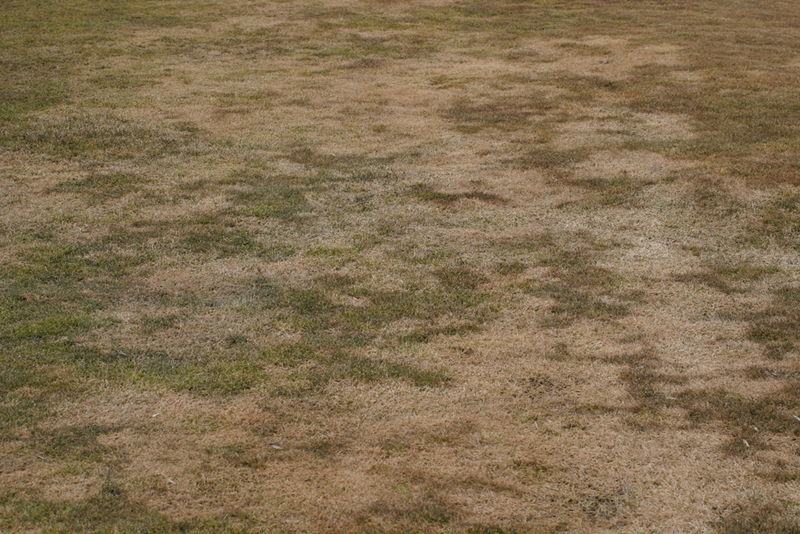 Symptoms appear after snowmelt as circular patches, 1 ft to 3 ft in diameter, of yellow, straw colored, or gray brown turf. Individual leaves are matted and often covered with a gray white mycelium which disappears as the grass dries. The leaves become grayish to silvery white, brittle, and matted. Large areas of turf may be killed, but more often only the leaves are killed and regrowth occurs from the plant crowns. These fungi produce sclerotia, small, hard, round structures, visible to the naked eye, on infected leaves. Size, color, and shape of sclerotia are used to identify species of Typhula. Typhula species survive the summer as sclerotia which germinate when exposed to wet, cool conditions in late fall to form fruiting bodies (sporocarps) or mycelium. The pathogens grow well at temperatures near freezing and under snow covering wet turf in unfrozen soil. The disease is favored by deep snow that prevents the soil from freezing, increases relative humidity within the turf canopy, and mats the grass leaves as well as high nitrogen levels which promote succulent growth. Minor Snow Molds: Coprinus Snow Mold and Snow Scald. Coprinus snow mold also called cottony snow mold is caused by two strains of Coprinus psychrombidus, one which produces sclerotia and one that does not. Symptoms appear at snowmelt as circular or irregularly shaped patches in which the leaves are covered by a white, wooly mycelium. Leaf lesions are water-soaked and rotted and turn brown and dry with dark red brown margins. The non-sclerotial strain tends to grow faster and produce more cottony growth; patches are larger and whiter than those of the sclerotial strain. Sclerotia of the sclerotial strain are obvious on infected leaves and are brownish black, ellipsoidal, and irregular. C. psychrombidus survives as sclerotia; the exact nature of the persistence of the nonsclerotial strains is not known. The disease is favored by prolonged periods of deep snow and can grow at temperatures slightly below freezing. Snow scald caused by Myriosclerotinia borealis affects all turfgrasses. Symptoms appear at snowmelt as patches of up to 6 in. in diameter of water-soaked leaves with gray mycelium and tan sclerotia. Leaves become bleached and die, while sclerotia turn black with maturity. Sclerotia are the survival structure during warm periods. A prolonged period of deep snow and frozen soils favors the pathogen which can grow at temperatures as low as 23° F.
Avoid heavy applications of nitrogen in late fall. Apply fertilizer a few weeks before dormancy. Slow release forms are recommended for fall fertilization. As a rule of thumb, no nitrogen should be applied after the first frost. Continue to mow the grass until growth ceases to prevent a tall canopy. Reduce compaction of snow by snowmobiles, skis, and animals. Prevent the formation of large snowdrifts by proper placement of snow fences, wind barriers, or similar structures. Promote rapid drying and warming in the spring by snow removal and improving drainage. Promote new growth in the spring with light fertilization. Reseed affected areas if regrowth does not occur. Maintain a low soil pH and high levels of potassium to discourage Microdochium patch. Several cultivars of Kentucky bluegrass and fine fescue resistant to Coprinus snow mold have been reported. Preventive fungicide applications should be made in late fall. Systemic (penetrant) fungicides which are absorbed and move within the plant should be applied before leaf growth ceases completely. Apply fungicides in sufficient volume of water to obtain thorough coverage (2-3 gal/1000 sq ft). A single application can give winter long control if the right fungicides are chosen and there are many to choose from. Combinations of a contact (protectant) fungicide and systemic are highly recommended. Biological control agents effective against Typhula blight have been reported. For a listing of fungicides currently labeled to manage these pathogens, refer to the Disease Management chapter of UMass Extension's Professional Guide for IPM in Turf for Massachusetts.